In stock -This product will ship today if ordered within the next 7 hours and 10 minutes. Mixture of purely natural, high quality, essential oils. Can also be rubbed onto the skin. Po-Ho essential oil for inhalation is made from the highest quality essential oils. It contains a mixture of the essential oils of peppermint, eucalyptus, juniper, caraway and fennel. It is available in a 10ml bottle. Alfred Vogel first wrote about Po-Ho essential oil in March 1929 in his first magazine, Das Neue Leben (A Fresh Start). The name comes from Po-Ho, the (Mandarin) Chinese for peppermint, one of the five essential oils in this refreshing classic amongst oils. Put a few drops of Po-Ho oil onto a handkerchief or bunched-up tissue, hold it to your nose and inhale. You can also put the essential oil soaked handkerchief into your pillowcase or next to your pillow to help you sleep better. If you need to inhale an extra boost of essential oils, put a few drops of Po-Ho into a steaming-hot bowl of water, lean over, cover your head and bowl with a small towel, and inhale. Do this carefully as the oils can initially feel quite strong to your eyes when you inhale. Po-Ho essential oil can also be rubbed onto the front of your upper chest – your body heat will release a constant supply of essential oils for you to inhale. The easy-to-carry essential oil inhaler stick is a convenient way of using Po-Ho. To use, insert the tip of the inhaler gently into your nostril, close the other nostril and inhale deeply. Repeat with the other nostril. Not suitable for children under 6 years of age. Do not use as eye drops, nose drops or as a nasal spray. Avoid contact with the eyes and sensitive skin or other sensitive areas of the body. Wash your hands thoroughly after touching the oil. Do not use Po-Ho if you are allergic to any of the essential oils or other ingredients of the inhaler stick. 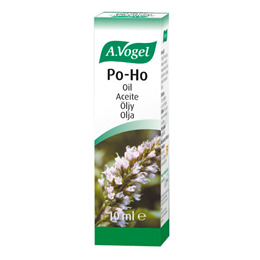 Below are reviews of A Vogel Po-Ho Essential Oil - Cold and Flu - 10ml by bodykind customers. If you have tried this product we'd love to hear what you think so please leave a review. A Vogel Po-Ho Essential Oil with peppermint and eucalyptus has been used traditionally to help maintain clear, cool breathing – particularly during the cold or flu season.